To most people Tabouleh is the queen of all Leventine salads, and I can understand why. Tabouleh looks sophisticated, tastes sophisticated, takes hours to chop all that parsley and uses that super-cool in-fashion ingredient Bulgar. To me a much simpler salad, Fatoush, takes that top position and by long way. 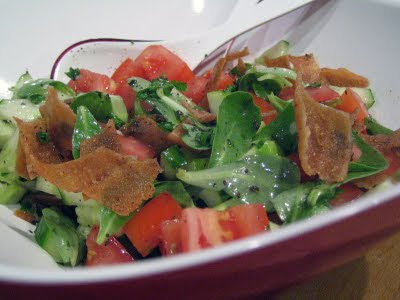 Fatoush is a simple salad of roughly chopped vegetables and fried Arabic bread croutons for nice crunchy texture. A tangy strong dressing brings the flavours together. To take your fatoush one step up and get that authentic taste you need a rather unusual ingredient, Purslane (pic). 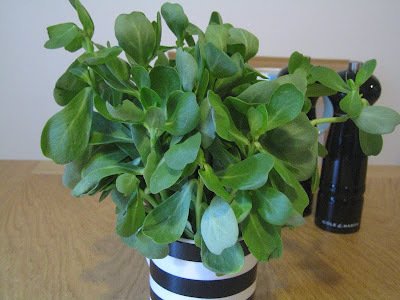 Purslane or Pa'aleh (بقلة) in Arabic is a leaf vegtable almost exclusively used in fatoush. It has a slightly tangy earthy flavour with a hint of bitterness. In London you can buy it from Damas Gate in Shepherd's Bush or some of the shops on Edgware Road. I am not sure if you can buy it in normal green grocers or in farmer's markets but don't be put off if you can't find it, use lettuce instead. In my family home in Syria we use lettuce rather than Ba'aleh 70% of the time. For a healthier version toast your bread under the grill instead of frying. Another variation is to add pomegranate molasses to the dressing (this stuff is in fashion in Syria and people, including myself, are trying to add it to everything). Cut the Arabic bread into small squares and fry in vegetable oil till deep golden colour. Drain on kitchen paper and let it cool down. Roughly chop the tomatoes and cucumber and pick the Ba'aleh leafs. Whisk all the dressing ingredients. Just before serving mix the bread vegetables and dressing and serve. Make sure you do this the last minute so the bread stays fresh and crunchy. Ohhhh, never thought to add dried mint to the dressing if I didn't have fresh--nice. And thanks for spelling out the Arabic for purslane. For some reason, it never ever sticks in my brain when I ask in a market (and I have asked many times). I actually prefer to use dry mint in Fatoush. I feel it tastes nicer. In Tabouleh on the other hand I much prefer fresh mint. You seem an expert on purslane! What else can you do with it? Wikipedia mentions it is used in Mexican and European cooking, but I never came across it. In Syrian the only other use (although I never tasted it) is to gently cook it in olive oil with onion and garlic and serve as a side dish with a squeeze of lemon. Interesting recipe you use both Sumac and Lemon my understanding was the former was used instead of as of couse in the old days there were seasons for citrus fruits. Does Sumac originate from Iran/Persia ? And does the ethnic root of Fatoush also come from that neck of the woods ? It is true sumac was originally used as a lemon alternative when lemon was out of season but these days you have both of them available all year long why not use a combination. Although both tangy but the taste is quite different and I find they compliment each other a lot. Regarding sumac, I am not sure where it originate from but it is wildly cultivated and used through the middle east and the Levant. And I agree with you on two major points: lemon and sumac are wonderful when combined; and pomegranate molasses is great in almost everything. I look for excuses to use it in my cooking! After a great experience with making your 101 Mezze, No. 7: Hummus, I'm going to try making several more of your mezze recipes. I love this kind of food. Keep this mezze series going! I will keep it going till I reach 101 (hopefully!). Please let me know when you try some. I would like to know if the recipe work or even more importantly if it doesn't work so I can fix it. Visited Syria just recently and discovered Syrian dishes. Came back to UK and have found your site which is great. I see so many of the dishes I experienced in Damascus. Like 'Not Delia' I began with Hummus, moved onto Fatoush - this weekend I purchased Pomegranate Molasses, so there's no stopping me now. Thanks for all the effort you've gone to in posting these recipes, it's appreciated. Welcome to my blog and welcome to the great world of Syrian food. Keep trying new dishes and please feel free to ask me for advice and help if you need any. My wife is asking what you thought of the Hummus? my grandmother used to boil purslane with the stems .she fried 2 gloves of garlic , 1 onion lightly. add two scrambled eggs then the squeesed puslane . add salt and pepper. to fatoush we add 1or2 green onions. Few people told me about cooked purslane. It is not something we do in our family. I should try it.